What route should the third phase of streetcar expansion follow? Once the UMKC Plan is funded and ready to go, what would be the next steps for us to getting another extension going? Should we wait for the UMKC expansion to be complete in 2022/23 or should we start earlier ( Late 2018/2019)? And if I may ask, What is your prefered expansion path? Thanks again for all the work you've done over the last 1.5 decades. I wish you a great retirement after the main extension is completed. Yea. Probably not achievable by a TDD. I was originally thinking that by the early 2020's there may Be enough city/county support to build something bigger so I included it in the poll. The corridor numbers were closer than I remember. I'd hope they would go up considering the success of the starter line. IIRC none of these extensions were viable financially as stand alone tdds, only when combined with the main street corridors. Is that going to be a problem with the timing of a next proposal? there may be some interesting news develop tomorrow evening. keep an eye on twitter. KCtoBrooklyn wrote: Extending through Waldo no the CCROW (and then maybe down to Three Trails/Cerner) might be the most useful extension, but I think there is still too much neighborhood opposition, so it didn't get might vote. Independence Ave would be a good extension, but I voted for Linwood to Michigan (somewhat selfishly since I live nearby). I don't think extending east of 71 would have much value (aside from appeasing East Side leaders) unless it went all the way to the stadiums. Going to Michigan could be a good starter route, with possible eastward expansion later. Did the original Linwood extension route go west of Main? I seem to remember it stopping there, but it seems like going west to SW Tfwy so it would reach Penn Valley CC would be a valuable destination. It may not be the most practical, but I would love to see it keep going west from there and go down Karnes Blvd through Roanoke Park and terminate at 39th and Wyoming (or keep going to KU Med). Broadway is close enough to walk. Not exactly comfortably, but it is close enough. I don't think extending west of main would be worth it unless it went down 39th. Bundle heading west on 31st into a commuter rail plan. I expect that demand will follow jobs. It's always about jobs. People will feel better with a slightly higher sales or property tax if they feel like it's possible to use the train to get to work and get a raise at the same time. DaveKCMO wrote: there may be some interesting news develop tomorrow evening. keep an eye on twitter. Did anything end up happening? Sure hope that is Bi-State. 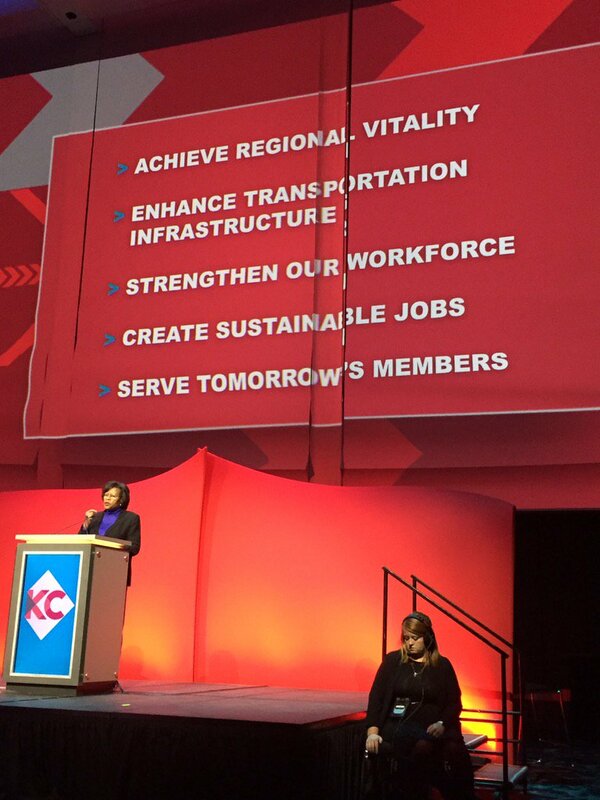 Glad the chamber is on board with sustainable jobs and transportation. Those are pretty broad terms though. Any specific strategy of projects they are gunning for? If I were the chamber- I'd have a specific goal of transforming the Blue Valley Industrial area into a sustainable jobs corridor. Solar, wind, batteries tech and cars (tesla), equipment needed for the infrastructure related to solar, etc. Focus should be on (re)training people from that area. And of course regional rail plan must be the transportation goal or we're not being serious about it. Yeah, those seem really vague and unmeasurable. beautyfromashes wrote: Yeah, those seem really vague and unmeasurable. most of the Big 5 items are. DaveKCMO wrote: most of the Big 5 items are. I thought they were more specific like, "Build the Crossroads UMKC Conservatory campus." They had a mix of specific and broad last time. I realize I am derailing this thread...so feel free to move to more appropriate spot, but I feel like these are worth reviewing since we have a "new" Big 5. A. Assessment: With input from regional education partners and research experts, the KC Chamber will gather and analyze data — both existing and new — to assess the current and future early childhood education conditions. Data collection to assess the status of early childhood education region-wide; and ongoing data collection to assess progress made through collaboration and investment. B. Buy-In: The KC Chamber, with the assistance of many community partners, will bring resources to the organizations that can have the greatest positive impact on regional education outcomes. The connection of high value tactics to resources. C. Collaboration: The KC Chamber and regional education partners will convene an organizing group to fully assess our early childhood education landscape and tactics for improvement. A shared vision of success. Champion: Terry Bassham, Great Plains Energy Inc. This was probably the most obscure...but if you think about all the momentum on Troost right now you've got to think it was either effective or prescient. Again, pretty vague, but with the Kauffman Foundation you could argue there was a good lead organization that has prioritized the strategy. If you remember, prior to this, Kauffman foundation was criticized for being too national in its prioritization and operations. The board shuffled the leadership and since then Kauffman has become much more KC-centric (definitely what Mr. K would have envisioned). This initiative has two components: (1) leveraging the $20 million NIH Clinical and Translational Science Award (CTSA) grant recently awarded to KU Medical Center and a number of regional partners by raising additional research funds to expand the scope of the collaboration, and (2) exploring the feasibility and funding options to establish an Institute for Translational Research. For additional information on the CTSA collaboration, see: http://www.kumc.edu/frontiers.html. I'm pretty sure this one was all about getting a regional tax passed to fund a campus for Stowers out where Cerner is building at Bannister. Big boondoggle and misallocation of resources. KU parlayed their grants into the goal of NCI designation. This is a good goal and I think may have been accomplished? ^ These were all much more specific. Besides 'Enhance Transportation Infastructure' I don't really know how any of the new goals could be measurable based directly on the activities of the announced teams. Vague goals are usually a way to avoid accountability toward completion. Of the five goals from last time, I think the people pushing the Crossroads arts campus should get some of the largest credit, even though we have hit somewhat of a wall. That seemed like a dynamic, big goal. They made excellent progress to where I could definitely see it happening soon. That team deserves some huge credit even though it wasn't completed. The goal should be making large jumps in progress, not taking credit on a weak goal that will largely be dependent on outside factors like, "Strenghthen Our Workforce" or "Create Jobs". It may be extra vague because they don't know or can't say what the Google thing is. tower wrote: It may be extra vague because they don't know or can't say what the Google thing is. Perhaps. That would be great if they purposefully kept it vague to hide something not roundly known by the public. Hopefully, they will open up the specific goal as it becomes more revealed.